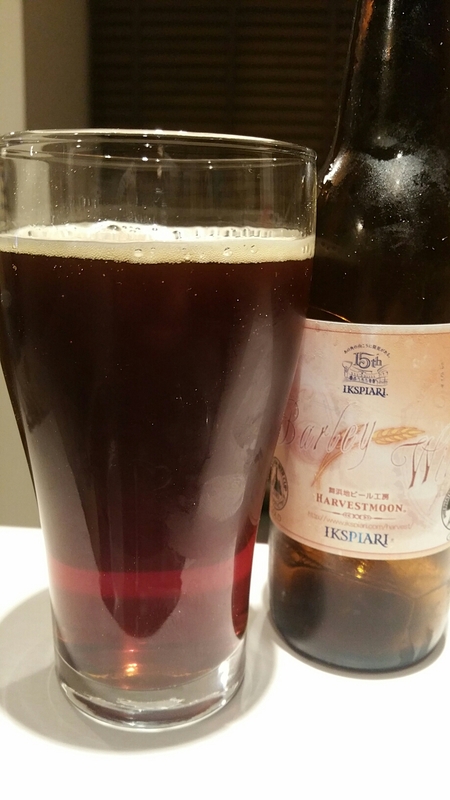 Harvestmoon Barley Wine is an 8% barley wine beer from Harvestmoon, based in Chiba. It was first brewed as part of Harvestmoon’s Anniversary celebrations back in 2006. Since then, Harvestmoon Barley Wine has been part of their Autumn seasonal range of beers and it can be found on both draft and in bottles. It’s also won some gold medals at a couple of beer competitions: the International Beer Cup back in 2009 and also the Japan Beer Cup in 2009 and 2010. An interesting take on a barley wine beer. Not boozy by any means at all. Harvestmoon Barley Wine poured out a deep copper-brown colour with a meagre amount of off-white head around the top of it. I wasn’t expecting any at all but what there was quickly dissipated to form a small oily ring around the edge of the glass. At 8%, I was also expecting some boozy notes to come off of it but nothing did. Had Harvestmoon hidden the alcohol? There were plenty of other interesting aromas though: barrel oak aromas along with caramel came through strongly but also the smell of a Christmas pudding too. The dried fruits were secondary though to the oak and caramel. I was hoping for Harvestmoon Barley Wine to bring some boozy kick to the body but alas it was missing. Even after warming up to room temperature, it lacked the pleasant alcoholic punch I wanted to taste. The sweetness was strong with a roasted caramel flavour pervading every sip (no way I am gulping a barley wine), there was no chance of any hop bitterness getting through and it didn’t, even in the aftertaste. At 8%, Harvestmoon Barley Wine is at the lower end of the alcohol levels for a barley wine, and I would have liked it to have been stronger. It isn’t a bad beer but not a great example of a barley wine.